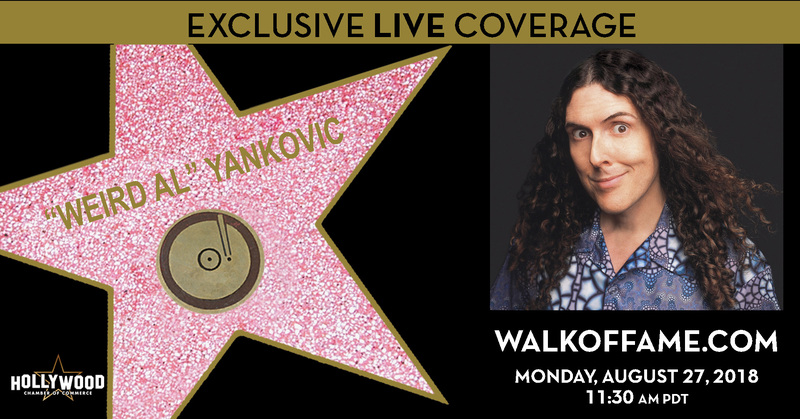 The Hollywood Chamber of Commerce is proud to announce that performer "Weird Al" Yankovic will be honored with the 2,643rd star on the Hollywood Walk of Fame on Monday, August 27th, at 11:30 a.m. PDT. The star will be dedicated in the category of Recording at 6914 Hollywood Boulevard across the street from the TCL Chinese Theatre. "Weird Al has single-handedly created an industry of parody! His fans have been waiting for this star for a very long time. We are excited to honor this very funny man on our world-famous Hollywood Walk of Fame," stated Ana Martinez, Producer of the Walk of Fame ceremonies. Helping Emcee Leron Gubler, President & CEO of the Hollywood Chamber of Commerce to unveil the star will be Dr. Demento and Thomas Lennon. Few would have guessed that "Weird Al" Yankovic - who as a shy, accordion-playing teenager got his start sending in homemade tapes to the Dr. Demento Radio Show - would go on to become a pop culture icon and the biggest-selling comedy recording artist of all time, with classic song and music video parodies such as "Eat It," "Like A Surgeon," "Smells Like Nirvana," "Amish Paradise," "White & Nerdy" and "Word Crimes." Now in his fourth decade as America's foremost song parodist, he has been the recipient of numerous awards, including four Grammys® (out of fifteen total nominations) and a string of Gold and Platinum albums. In 2015 and 2016, Weird Al's Mandatory World Tour encompassed 200 shows throughout the U.S., Canada, Europe and Australia, including two nights at the Hollywood Bowl and a sold-out gig at New York's Radio City Music Hall. So far this year, Weird Al performed 77 shows as part of his Ridiculously Self-Indulgent, Ill-Advised Vanity Tour, where he and his bandmates of over 35 years played set lists comprised almost entirely of his original non-parody material, and without any of their signature high-octane production (no costumes, props or giant video screens). And in 2019, Weird Al will follow up his most bare-bones tour with his most extravagant tour ever, Strings Attached, where he and his band will be backed every night by a full orchestra. Weird Al's 14th studio album, the Grammy® award-winning Mandatory Fun (2014), became the first comedy album in history to debut at No. 1 on the Billboard Top 200 chart, and the first ever to reach the top of the chart since 1963. Yankovic set the U.S. record on Spotify for having the most tracks from one album in the viral top 10 at one time, taking the top four spots. In addition, his single "Word Crimes" debuted in the Billboard Top 40, making Weird Al one of only four artists to have had Top 40 singles in each of the last four decades along with Michael Jackson, Madonna and U2. Al has remained active as a recording artist. June 2017 saw the release of Captain Underpants: The First Epic Movie (Dreamworks), for which Al co-wrote and performed the film's theme song. In 2017, Al wrote and performed "The North Korea Polka (Please Don't Nuke Us)" for Last Week Tonight with John Oliver (HBO). That same year, Legacy Recordings released Squeeze Box: The Complete Works of "Weird Al" Yankovic, a remastered 15-disc box set (including a rarities album) plus a 120-page book of archival photos, all housed in a replica of Weird Al's trademark accordion. Al also recorded cover versions of the Squidbillies theme for Adult Swim and the Ramones' "Beat on the Brat" for a Dr. Demento compilation album, and he produced remixes of two hit singles for Portugal: The Man ("Feel It Still" and "Live in the Moment"). In March 2018, Al delivered "The Hamilton Polka," a frantic tour de force mash-up of 14 songs from the Broadway smash, commissioned by Lin-Manuel Miranda and released as part of "Hamildrops" series. In addition to his cult-hit feature film UHF (1989), his late '90s CBS Saturday morning series The Weird Al Show and numerous AL-TV specials he has made for MTV and VH1 over the years, Yankovic has remained a staple of film and television, from appearances on The Simpsons, 30 Rock, The Goldbergs andHow I Met Your Mother to performing live on the Primetime Emmy Awards and starring in his own concert specials for Disney, VH1 and Comedy Central. In 2015, Yankovic took over as co-host and bandleader for the fifth season of IFC's Comedy Bang! Bang! Currently, Al can be heard as the voice of the title character in Disney Channel's animated series Milo Murphy's Law. His other voice acting work includes appearances on Bojack Horseman, Gravity Falls, Adventure Time, My Little Pony: Friendship is Magic, Wander Over Yonder, and the DC animated feature Batman vs. Robin). Yankovic added "New York Times bestselling author" to his resumé in 2011 with the release of his children's book, When I Grow Up (HarperCollins), followed two years later by My New Teacher and Me! An animated series based on his children's books is currently being developed in partnership with the Jim Henson Company. In 2012, Yankovic released Weird Al: The Book (Abrams), an illustrated hardcover on his life and career. The same year, Yankovic became not only MAD Magazine's cover boy, but the first guest editor in their 63-year history. For more information on "Weird Al" Yankovic, please visit weirdal.com. For more information please contact dave@weirdalstar.com.